The political pundits over at the Bavarian CSU party must be looking at headlines with a worrying frown by now. Faced with regional elections in two weeks and seeing an onslaught on the right where the anti-immigrant AfD is eating at their voting base, the news looks grim, to say the least. This weekend’s headlines in Germany: Turkish President Recep Tayyip Erdogan wrapped up a three-day trip on by opening a large mosque, and an Afghan immigrant stabbed three people. They can only hope that the Germans are turning away and looking at the Bundesliga (German soccer) instead. Yes, the diplomatic calendar planner of Chancellor Angela Merkel might have overlooked the pending German regional elections in Bavaria when he thought it was a good idea for Germany’s leader to host a controversial visit with Turkish President Erdogan who on his last day opened a grand mosque in Cologne (the city by now worldwide known no longer for its Catholic cathedral but the 2015/2016 New Year’s Eve mass sexual assault attacks by immigrants). 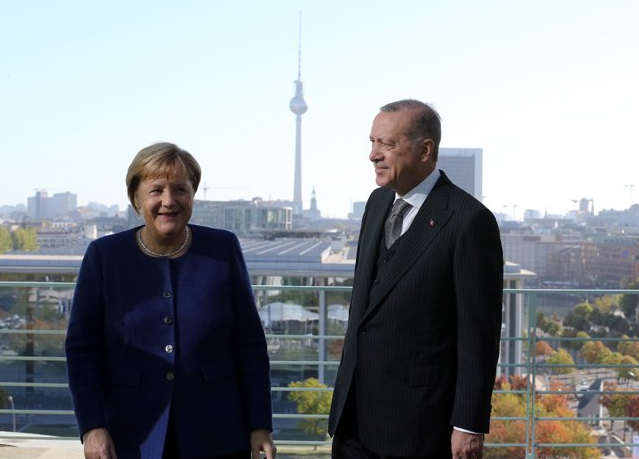 Mr Erdogan, who was met by protesters and supporters (Cologne has a large Turkish immigrant population), said the visit had been "extremely successful." "I believe our meetings for two days have cemented a long-established Turkish-German friendship," he said of the visit that aimed to mend ties with Berlin after two years of tension. He added that Turkey and Germany "need to focus on joint interests, leaving aside some recent differences of opinion." Inaugurating one of Europe's biggest mosques, the Turkish leader stated: "In a critical period, we have made a fruitful, successful visit to Germany." "I stressed that we need to put aside our differences and focus on our common interests." Meanwhile, during his visit with German President Frank-Walter Steinmeier, Erdogan alluded to the "hundreds, thousands," of terrorists living in Germany, referring to alleged members of the Kurdistan Workers' Party (PKK). Mr Steinmeier did not respond in kind. In the end, German authorities on Friday cancelled an open-air event outside the mosque, citing security concerns for which some 25,000 people had signed up. Erdogan is the Patron of the Syrian crisis. Everything that happens there has his cabinet fingerprints all over it. I would love to see an "Assad vengeance".